My bad, it's not easy to tell gender from a screen name, unless said name makes it obvious. I wish I could have chosen my courses. Unfortunately, I was placed into a special education program for the simple reason that I was on medications. By their reasoning, because I was on medications, I was mentally impaired with a learning disability.... 23 actually. Yeah, sad, isn't it? This is actually the best advice I've gotten from anyone in terms of getting into a shop. The only things I really have yet to learn is wheel building, suspension repair, and brake repair. I would actually like to work at the very shop I go to when I'm not able to fix something myself. Thanks! May you live a life of fortune! You got any tips for the budding enduro racer? My wish is to race professionally, but independently. No sponsors. Nothing. I understand that its up to us to learn, period. What peeved me is your decision to omit the specificality of what I was learning, which is bikes. The fact that it took a full decade to learn what I know about simply maintaining them I think says something both about my dedication and the effort required to become a bicycle mechanic. I actually never learned much in school. Up to 8th grade, it was partly stuff I'd heard or learned in earlier years. From high school on, i basically learned nothing, as it was all nothing but repetition. They were just going over the same exact stuff i learned in 8th grade, just made super complicated to make it SEEM like it was new material. What do you mean by speaking in absolutes? Just so I know what it is I have to deal with. I also know I know very little. Which is why I ask deliberate questions aimed at getting the most information possible when I don't have enough knowledge on a subject, usually. I sometimes go too far. There are some things though that I am quite authoritative on, such as bike work and diagnosing bicycle issues. Any one of you could honestly give your malfunctioning bike to me, and within a day or two, I could have it diagnosed and fixed. If I can't fix it, you would be the first to know. I also charge much less than the bike shop, cause I have no overhead I need to cover. Nah, I said I liked where it was going, because who doesnt like being amused? I do have one question though: is this a good book to start with? [commercial link removed] I just feel like that would make a good foundation for bladesmithing. I like where this is going, haha! I really mean the black cherry red, where you can just barely begin to discern a glow. I would actually tell them to start at the beginning, removing a tire and patching the tubes, as that is the most common maintenance activity done with bikes. Then I will have the person service the chain, then the cranks, then the bearings, then the hubs, so on and so forth. This is how I myself started. I do understand the bare minimum of the basics, that when the steel gets hot, it gets easier to work, and when it glows california orange peel orange, it is ready to be forged (IIRC). A dark cherry color is best for annealing spring steel, if my memory serves me right, where the orange would be far too much for annealing. Pickin and choosin out of a whole is one of my pet peeves. I know I won't be able to learn all of what I need to within 6 years without guidance, and this is without mastering the craft, which I understand will take 10 years or more, so I won't even try to teach myself on this. The only reason I took 11 years to learn what I do know about bikes is because I had little to no support in it since age 12, and I still don't know everything. I still need to learn how to rebuild suspension components, build a wheel, rebuild brake calipers, build a frame, and design suspension systems. All of that would take 2-4 years with professional guidance. Unfortunately, my bike knowledge will only remain relevant as long as bicycles are pedal powered and travel on the ground on wheels and spokes (they will eventually make wheel-less bikes, I swear it). Well, if this is how much I've already learned, then yeah, I do have a whole lot left to learn. It should be noted that I took 11 years teaching myself everything I know about bicycles, so with some guidance, I should be able to learn all of this within 5 to 6 years. Thanks again for all the information, and the time you guys took to type this all out for me. Thanks for correcting me on the weights, and the type of armor actually used. Merlin was not a Hollywood production, let alone a US one. It was made in the UK, and broadcast on BBC. So I suppose an era correct costume is out of the question then. That means my only option is to do this the way it would have been for each bit, from the chainmail to the plate armor to the sword. I honestly don't care what anyone says, that sword is gorgeous, and I want to forge an authentic battle ready version of it, right down to the balance, no matter what it takes. Please don't take my determination to do this as my wanting to disregard what you guys are saying, thats not the case at all. It's just the fact that I love the look of the complete outfit, and wish to use that as a reason to learn new skills outside my passion, which is maintaining those two wheeled contraptions they call bicycles. Thanks guys, I'll look into it. Unfortunately, I dont have any vehicle capable of traveling very far at the moment, nor do I have funds available for paying for travel tickets and such. Fortunately, I do have the time available. I see. How would you go about making this as historically accurate as possible? Or should I consider this as nothing more than a costume project? If I recall correctly, a battle sword of that time weighed in the area of about 25-30 pounds, depending on the length of the sword and the weight of the pommel and guard. Alternatively, an arming sword weighs in the area of 10-15lbs so it would be easy to control. They are also shorter than a battle sword. I really don't mind combining the labor with monetary compensation. It would give me a chance to practice what I've learned. 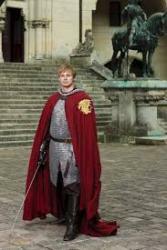 Hey guys, I am planning on forging King Arthur's armor and Excalibur shown in the tv series Merlin for a halloween costume. However, I don't know where to start, or how to build a forge. If someone in the Boise area has a forge and is willing to take the time to teach me the craft, I would be very willing to compensate in any way I can. I may not be able to compensate entirely in the financial aspect, but would be very happy with compensating with labor. Keep in mind that I wish to perform these tasks with era correct equipment and techniques. Also, this Excalibur will be an exact replica of the sword seen in the series, down to the inlay and runes. 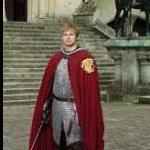 Both attached images show the outfit, and the sword shown in the second is the Excalibur. I would be very happy spending several years learning the skills required for forging such a blade. Anyone willing to teach me these skills, please reply. Also, anyone who will have crucial tips is welcome. Anyone trying to tell me that this project is impractical, or that it should not be attempted without at least 20 years of experience, I don't particularly want to hear it. I am a very fast learner given the proper teacher, and am very mechanically inclined.